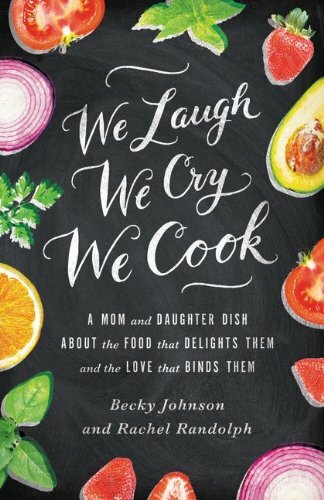 If you, like me, served a big bunch of family and friends a large Easter dinner yesterday, then I declare tonight to be “Cook’s Night Off!” If, however, like me, the thought of getting dressed, driving to a restaurant, and making polite conversation with other human beings sounds like it would take more energy than you currently have leftover, this AMAZING and easy sandwich recipe will help you get out of the kitchen and onto the comfy couch quick. Sorry about the long name. I tried to work with just the initials (a la the “BLT”) but “CCNCMC Sandwiches” sounded like robot food. I also give you permission to eat this buttery deliciousness in your most comfy T-shirt and stretchy pants. Or better yet, just wear your PJs and ratty old robe. Home chefs that serve big holiday meals deserve to be as lazy as you want to be the next day. Wallow in it, I say! Feel free to substitute ham if you’ve got lots of it leftover and want to use it in place of chicken or as an addition to it. I am personally a little “hammed out” today. A vegan version also follows, because I love my daughter and I want her to taste this dynamite flavor combo! Mix whipped cream cheese or Tofutti with chopped nuts and green onions. Spread 4 pieces of bread with this mixture on one side. 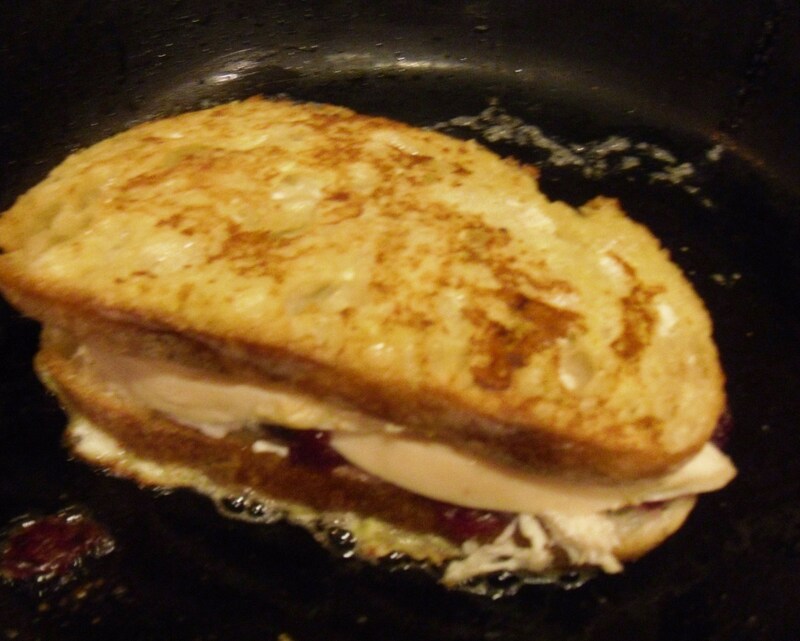 Lay two slices of chicken or turkey on two slices of the bread. (Add extra layer of chopped nuts in place of meat if you are vegan.) Spread cranberry sauce on the other two slices. 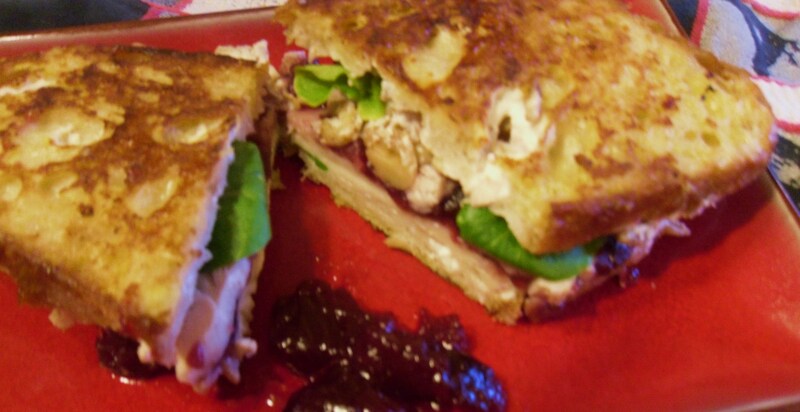 Put together to make two chicken-cheese-walnut-cranberry sandwiches. Cut in half, tuck in a few arugula leaves, sprinkle tops lightly with powdered sugar. 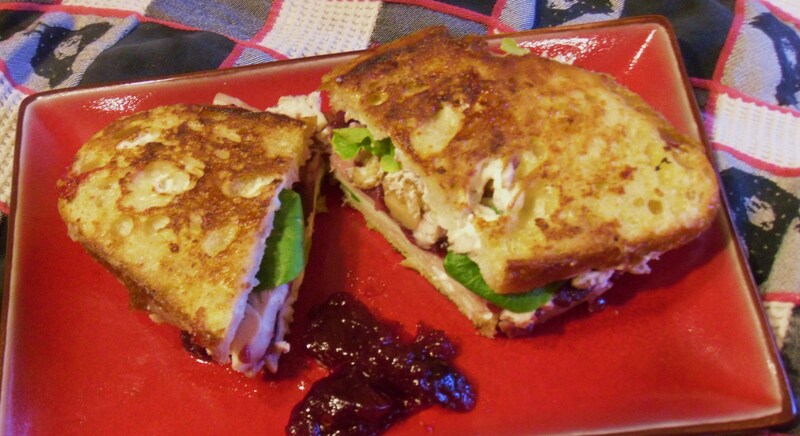 Serve with extra dollop of cranberry sauce if desired.